Rinse out the mixing bowl, then add the melted butter and Panko, and use a fork to stir everything together until it's evenly combined. 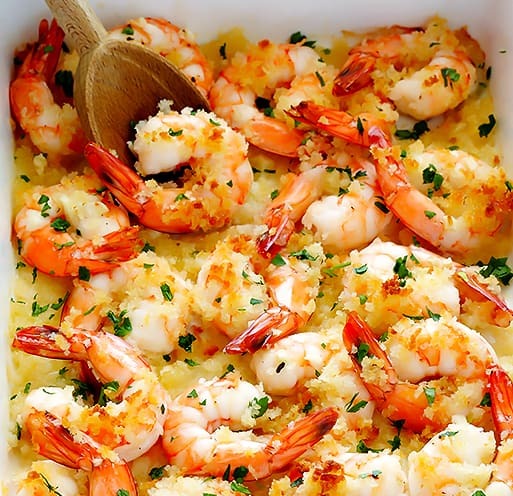 With your fingers, sprinkle the mixture evenly in the baking dish over the shrimp. Transfer dish to oven and bake for about 7 minutes, or until the shrimp are just turning pink. Switch the oven over to the "high" broiler setting. Then broil the shrimp for 2-3 more minutes or until they are totally pink and cooked through, and the Panko starts to toast and turn slightly golden. Remove and drizzle the lemon juice evenly over the shrimp, and sprinkle on the parsley. Serve immediately.